I'm a 20-something college grad who, like many of my friends, would like to begin preparing for retirement. Unfortunately, personal finance wasn't the sort of thing that was taught in school. What, specifically, should I do to get started? --S.V. You're hardly the only young person who feels he lacks the information to get a leg up on retirement. Almost 20% of Millennials polled in a recent BNY Mellon survey said they receive no financial info at work or from educational institutions, and nearly half admitted they're making a blind guess about how large a nest egg they'll need for retirement. But cheer up. It's not as if you need to take a formal Retirement Planning 101 course to get on the path to a secure retirement. At heart, retirement planning is pretty straightforward, so you can easily pick up most of what you need to know as you go along. I know this from experience. When I left Penn back in the 1970s with an economics degree, I knew nothing about personal finance. The curriculum was all utility functions, supply-demand curves and balanced-budget multipliers. Yet I managed to suss out a reasonably effective way of saving and investing for retirement, and I'm sure you -- and anyone else willing to follow a few basic principles -- can too. Here are three specific things you can do to get -- and stay -- on track. 1. Start saving at least 10% of your salary, pronto. There are few absolute truths in life, but here's one of them: Unless you save regularly, there's virtually no chance you'll be able to live comfortably in retirement. So find a way, any way, to begin stashing at least 10% of your salary in some type of retirement account (although 15% would be even better). If your employer offers a 401(k) or similar workplace plan, that's the best place to start. In addition to some valuable tax breaks -- with a traditional 401(k) you don't pay tax on your contributions or earnings until you withdraw them, preferably in retirement -- most employers also kick in matching funds that can significantly boost the value of your account. No 401(k)? Fine. Open up a traditional IRA or a Roth IRA -- Morningstar's IRA calculator can help you decide which is better for you -- and contribute the maximum, which is $5,500 this year and next for people under 50. If you still have money to save after maxing out such accounts, save in tax-efficient vehicles like index funds in a taxable account. Contrary to conventional wisdom, you don't have to do a lot of fancy budgeting to save. If you arrange things so money is automatically deducted from your paycheck before you have a chance to spend it -- as is the case with a 401(k) -- you'll be forcing yourself to get by on what's left over (provided you don't rack up credit card or other debt to spend more than you earn). But if you'd like some specific ways to free up money to sock away, here are 10 savings tips to get you on your way. Wherever and however much you save, start immediately; the price of procrastination is high. For example, a 25-year-old who earns $40,000 a year gets 2% annual raises and saves 15% of pay each year would have just shy of $1.25 million at age 65, assuming a 6% annual return. If that same person holds off until 30 to start saving, he would end up with roughly $830,000, or about $420,000 less just for waiting five years to get going. 2. Go with a simple and low-cost investing plan. The message you get from many financial services firms is that to be a successful investor you've got to sort through dozens of investments to come up with the "best" choices and then constantly tweak your holdings to reflect every new mutual fund or arcane ETF that comes along. Nonsense. The more complicated your investing strategy is and the more investments you accumulate, the harder it will be to manage your portfolio and the more things that can go wrong. Simpler is smarter. All you've got to do is create a basic mix of broadly diversified stock and bond funds that jibes with your tolerance for risk and the length of time you plan to keep your savings invested. For someone your age, that likely means keeping 70% to 90% of your retirement savings in stocks and 10% to 30% in bonds. You can find a blend that's right for you by going to this risk tolerance-asset allocation questionnaire. Once you've settled on an appropriate mix, don't mess with it, except perhaps to rebalance your holdings once a year to bring them back to their original proportions. After you've gotten a handle on how you plan to divvy up your money between stocks and bonds, you can move on to specific investments. The best choice is to go as much as possible with broadly diversified low-cost index funds. In fact, you can get by with just two funds -- a total U.S. stock market index fund (which gives you virtually all publicly traded domestic stocks) and a total U.S. bond market index fund. If you want to include exposure to foreign stocks, you can add a total international stock index fund. If you prefer an even simpler approach, look into a target-date retirement fund, basically a fund that gives you a pre-set mix of stocks and bonds that becomes more conservative as you age. Or you can check out a "robo-adviser," a new breed of low-cost online investment management that uses algorithms to build portfolios, or for that matter even hire a financial planner for a flat fee or on an hourly basis to help you set a basic investing strategy. If you're doing your investing within a 401(k) or other company plan, you may not have all the options I've described above. In that case, do your best with the choices you have to create a simple mix of funds that gives you broad exposure to the stock and bond markets while keeping costs low, if possible below 0.5% a year. Holding investing fees and costs to a minimum is especially important today given that many advisers expect that stocks and bonds will deliver lower-than-average returns in the years ahead. 3. Relax. You don't want to be one of these people who are always checking their account balance or constantly re-jiggering their investment strategy based on the market's ups and downs or the latest scuttlebutt about the Fed. If you're saving on a regular basis and investing in an appropriately diversified portfolio of stocks and bonds, you can put retirement planning on the back burner and instead turn your attention to the other things you need to accomplish in life, like nurturing your career, raising a family, having fun, etc. In fact, once you've got the basics of saving and investing covered, all you really need to do is check in periodically -- say, once a year -- to confirm you're making progress, which you can do by plugging your savings rate, account balances and other financial details into a retirement calculator that uses Monte Carlo simulations to estimate your chances of being able to generate the income you'll need throughout retirement. If your chances of success are declining from year to year, you can re-run the numbers (or have an adviser crunch them for you) to see how moves like saving more, investing differently or postponing retirement might improve your outlook. You'll undoubtedly have to make many more decisions over the next few decades as you progress through your career toward retirement. But for now at least, the steps that I've outlined should be more than enough to help you get your retirement planning underway. Have you recently achieved a financial goal? Paid off debt? Built up a large savings account? Purchased a new home? Tell us how you did it. 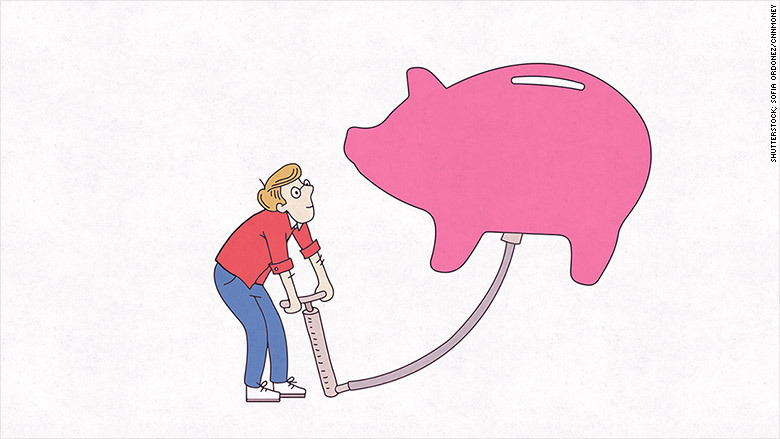 Share your saving success stories and you could be featured in an upcoming article on CNNMoney.